When I cut this dress out I knew I'd have to make it and wear it soon, since it's a little on the winter-ey side. Today is the last day of February, and I figured, the last day I should dress for winter, after seeing so many cute spring styles in magazines and stores! 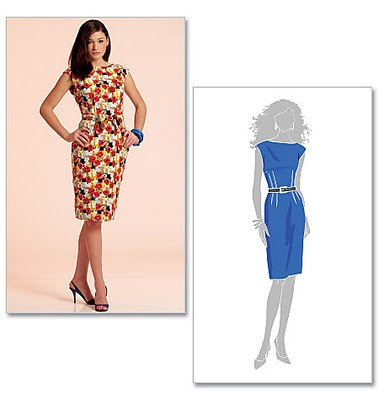 The pattern would work for any season--McCall's M5845. It's an interesting one since it has outward-facing darts, meant to be exposes, and it has a low, rectangular-shaped back. I used a red plaid poly blend suiting from JoAnn's that I bought at half off the clearance price, so like $2/yard. I didn't do the exposed darts, instead bringing them in to the inside like you normally would, figuring that the plaid gave the dress enough interest and the bright color was as funky as I wanted to get with it. Today, though, I'm wearing it with a black crewneck cardi and a wide black belt over! And black tights and cute black heels. Any other accessorizing thoughts are welcome! Although I probably won't wear it again till next fall... what d0you think? I love that dress. I have that same pattern and I have never made it. Great dress. I am inspired! I LOVE the fabric you used and think the dress is great on it's own. With the blazer I find the neckline is too high and it looks constricting. Looks great. I love the plaid! It is a fun pattern, pretty simple but with some unique elements. Wearing it I noticed the shoulders are very wide, almost like a built-in cap sleeve. I think I'm going to have to get this pattern, it's adorable! I love it in the plaid and agree with your decision to pull the darts to the wrong side. Turned out cute! It would look great with a cream cardi or jacket too. I referenced a tutorial you had posted a while ago in my post today! Lovely! Great job. :) I'd wear it with tights as well or with some nice wedges as it gets warmer, why restrict beautiful to this season? Really lovely dress, I like plaid/ tartan, and I'm the sort of person who is into wearing a turtle-neck under a tartan dress, 60s style. I think you should wear it on its own and definitely not stop wearing it now. In Wales it looks like winter is certainly not over yet! Seu vestido ficou PERFEITO, a estampa é linda e o caimento impecável. Parabéns. It would look cute with a gold metalic sweater, or maybe white! Great job! I am so mad for plaid. I have a question, though. I notice you often use poly blend fabrics, while I avoid them because I feel like they don't breathe. Is there a particular reason you choose to use them? P.S. How awesome would the dress look with a rope of pearls! I just discovered your blog through a link from Shoes and Sewing, and I really like it! You are so talented! I wish you the best for your August wedding, it really is exciting. I will be following along! turned out beautiful. keep on sewing! have you won the "best dressed" award in the office yet? Great dress, I really love the design!